The Convention on the Conservation of European Wildlife and Natural Habitats is better known as the Bern Convention. Ireland is a signatory to the Convention which it later ratified in 1982. But, twenty eight years later has the Convention played any serious role in fulfilling it's obligations to our most tormented and persecuted (Bern protected!) of Irish mammals, the Eurasian Badger? Article 7 of Bern; Requires each contracting party " to take appropriate and necessary legislative and administrative measures to ensure the protection of the wild fauna species specified in Appendix III". The European Badger (Meles, meles) is listed in Appendix III Bern protected species. Badger killing, for 'research purposes' is undertaken by the Department of Agriculture, Food and Fisheries (D.A.F.F.) who have been snaring badgers since the mid eighties. 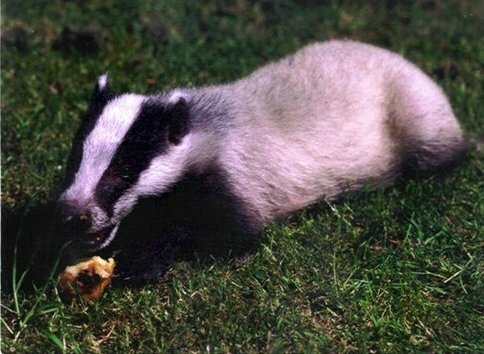 The alleged link between badgers and Bovine Tb in cattle still lacks solid scientific evidence. The route of transmission from badger to cattle is not yet fully understood. The licence for the killing is issued by National Parks and Wildlife Service (NPWS). In recent times, up to 7,000 badgers have been killed every year. Ironically the same N.P.W.S. (located in the Department of Environment, Heritage and Local Government) is charged with the protection of badgers under Irish wildlife legislation. By implementing a long - term intensive eradication strategy how can the Government claim to be honouring the "appropriate and necessary legislative and administrative measures" for badger protection? Just how many dead badgers are required for it's intensive 'scientific research'. Tens of thousands? 29,000 reactor cattle were removed in 1997. Following an interim drop in cattle Tb figures, by 2008 reactor numbers had risen once more to 30,000, despite the killing of close on 46,000 badgers in that same period. To add to that, the number of badgers illegally killed in our countryside every year, is unknown but is reckoned to be substantial. "Any exploitation of wild fauna specified in Appendix III shall be regulated in order to keep the populations out of danger……Measures to be taken shall include: (a) Closed seasons and/other procedures regulating exploitation". The Irish Government refuses to recognise the need for a closed season on snaring during the animals' breeding period - January to May. It is a most callous decision which has completely disregarded the urgency for halt on snaring at this, the most vulnerable period in the badger year. The excuse used is, that the badger is not a hunted species in Ireland, unlike some European countries where it is a recognised legal 'sport'. The lack of legal status has, to date, failed to deter the activities of our badger-baiting community. Would our Government accept the likelihood that a badger might be remotely concerned with the legal status (or lack of it) of the person who is trying to take it's life? The open season on badger-killing has led to serous welfare problems which occur when nursing badgers are snared and killed by DAFF's badger trappers, thus, leaving dependent and orphaned cubs to die underground of starvation and hypothermia. Why trappers have never been instructed to release lactating sows, demonstrates the complete lack of concern by NPWS and DAFF for the animal's welfare. To attempt a cub rescue is out of the question since it would be necessary to destroy the entire badger sett. We can but guess the number of cubs who have suffered this horrendous fate but over the years. Because they are the offspring of a protected species, the cubs, have without doubt, not been afforded the protection bestowed on them by the Bern Convention. Article 8 (3. 1. 1.) of Bern "In respect of the capture or killing of wild fauna species specified in Appendix III and in cases where, in accordance with Article 9, exceptions are applied to species specified in Appendix II, Contracting Parties shall prohibit the use of all indiscriminate means of capture and killing and the use of all means capable of causing local disappearance of, or serious disturbance to, populations of a species and in particular, the means specified in Appendix IV". It cannot be denied that the multi-strand wire snare used by D.A.F.F. is indiscriminate and cruel. However, (perhaps to appear to be a truly Bern - compliant member ) the same snare is now referred to as a 'restraining harness'. It has somehow been granted official recognition in the amended Wildlife Act (2000) ratified relatively recently in 2003. Non-targeted animals such as dogs and foxes, have been trapped. Badgerwatch has received numerous reports of such incidents. Badgers are caught (usually around the thorax or groin area) and held in the very tight wire snare overnight or indeed sometimes an entire weekend. The animal is therefore, held captive over-ground in daylight hours, defenceless and distressed along with any injuries sustained in the snare, in a state of high risk from other animals and of course, humans. Snares need by regulation, only be checked every twenty-four hours. Since 2000, agreements reached under the terms of the Programme for Prosperity and Fairness (P.P.F.) allowed D.A.F.F. to escalate it's badger culling strategy. Mrs. Mary Coughlan, former Agriculture Minister revealed that a grand total 6,000 snares are set nightly across Irish farmland. The annual badger kills by D.A.F.F. 's trappers have now reached yearly levels of approximately 7,000. This, the most ferocious of culls, often referred to as "Slaughter masquerading as science" was originally given a four-year lifespan. Delayed by lack of resources along with the outbreak of Foot and Mouth disease (2001) meant it didn't get under way until 2004. The killing didn't stop, as it should have in 2008. but it is understood that this killing will continue until a suitable vaccine becomes available. "Local disappearance of a population of Appendix III animals should therefore be avoided:"
NPWS issued the snaring licence which permitted the P.P.F. cull. This enables Dept. of Agriculture to cull badgers on 30% of agriculture land. It is the equivalent of clearing badgers from one entire Irish province. Badger snares are usually set at the start of week one and trappers work for 12 nights of a two week period. Snares should be checked by l.pm the following day and badger(s) held will be shot in the head by a .22 rifle. The licence, which is valid for one year, permits culling within a 2km radius of the index ( Tb Infected) farm. Having completed the initial period of two working weeks, the licence allows the trapper to return regularly within the year to check for signs of renewed badger activity. If activity is suspected, snares will be laid again. At the end of the twelve month period of intensive snaring it is almost certain that total disappearance of local badger populations has been achieved. According to Agriculture's own figures, 26,000 badgers were culled from 1985-1999. Approximately 58,000 animals removed since 2000. D.A.F.F. will claim it is killing infected badgers only. Truth is, the majority of badgers killed are healthy BTB-free animals. Despite the emphasis on culling badgers, Irish officials revealed in the Farmers Guardian (24/11/06) it, (culling) is a stop-gap measure that will not eradicate Tb in cattle. Only a vaccination for badgers and cattle will eradicate the disease. Article 9 Allows contracting parties to make exceptions from the provisions of Articles, 4, 5, 6, and 7 and from the prohibition of the use of the means mentioned in Article 8 (use of snares and traps for large scale capture etc) provided that there is no other satisfactory solution and the exception will not be detrimental to the survival of the population concerned. "'There is no other satisfactory' solution: DAFF Officials have already been quoted saying " culling (badgers) is merely a stop-gap measure that will not eradicate Tb in cattle". Why then is DAFF pursuing a worthless strategy which by it's own admission will not solve the problem? If indeed, culling was the solution, Ireland should have been declared Tb-free by now. Scotland has achieved Tb-Free status without resorting to a culling strategy.
" The long awaited vaccine, according to DAFF is now at field trial stage. With a solution so close at hand, is there justification for the continuation of their intensive badger slaughtering strategy?
" Ireland was declared Bovine Tb-Free in 1965. The drastic reduction of Tb levels in cattle from 17% to extremely low levels was achieved without killing a single badger is significant because it clearly demonstrates that the badger may play a minor role or indeed, no roll at all. It would be unacceptable to suggest that present BTb levels in cattle are due entirely to badger transmission to the total exclusion of other factors e.g. unreliable skin test that leaves infected animals behind on farms and excessive cattle movement both within herds and between herds. Ireland's one and only reference to the badger population was Dr. Chris Smal's Badger and Habitat Survey of Ireland, began in 1989 and published in 1995. The figure was essentially an estimate. The validity of a population of 200,000 badgers in the Republic has never been challenged. One thing is certain there's nowhere near 200,000 badgers on this Island now (recent figures estimate a badger population of 84,000) and whether there will be, ever again is unlikely. The damage has been done. The word is out on poor old Brock. He's now public enemy number one. Despite reassurances of a vaccine solution to bovine Tb, it is very likely that badgers will continue to be killed illegally in the Irish countryside. We can expect the legal slaughter of badgers to continue into the foreseeable future. Field trials are under way although the promised vaccine is 4 years down the line. It's understood that the snaring strategy will accompany the initial years of the vaccine. There are tough times ahead for our badgers (what's left of them) and indeed those of us who care but can do nothing except watch the madness continue and which indeed promises to continue unabated in the coming years. Thank you, N.P.W.S. and European CONvention on European Wildlife and Natural Habitats (Bern).for nothing. New legislation to ban deer hunting with dogs has been passed. BUT THE WARD UNION IS STILL HUNTING STAG! The Wildlife (Amendment) Bill will prohibit deer hunting with packs of dogs and will increase the maximum fines for other wildlife related offences. The Co Meath-based Ward Union Hunt will be the only group affected by the ban. n"The Government has decided that this particular hunting practice should cease for animal welfare and public safety reasons," Minister John Gormley said. He believes the Bill will have large public support. and said it would have no implications for other country pursuits such as fox-hunting, hare-hunting, hare coursing or deer stalking. Fines under the Wildlife Acts are being increased from €500 to €1,000 for a first offence on summary conviction, from €1,000 to €2,000 for a second and from €1,500 to €5,000 for a third or subsequent offence.The maximum fine for conviction on indictment would be doubled from €50,000 to €100,000. These fines were last increased in 2000. There are no changes in maximum times of imprisonment terms, which range from three months for a first offence up to a term not exceeding two years for those convicted on indictment. Since last newsletter, three of our members have passed on within a short time of each other. The late Deirdre Hamilton from Dublin had been one of our first members. To her son Peter, we express our sincere sympathy. Siobhain O'Sullivan, another precious Badgerwatch member who died in August, at a young age, was for all of her life a tireless worker for all animal causes as anybody involved with Waterford Society for the Prevention of Cruelty to Animals will testify. Siobhain is survived by her husband Ger and her two young sons, Shane and Neil. Damian Meagher's sudden and untimely death at the age of thirty seven, also occurred in August. 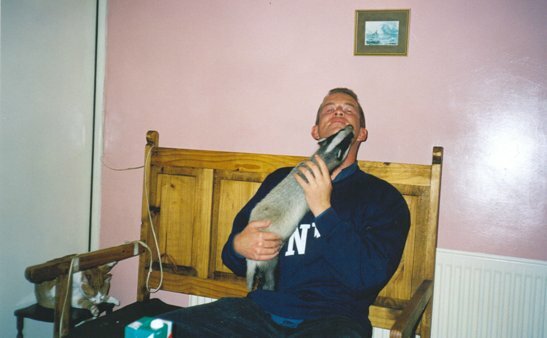 Damian was a true lover of badgers since his early years and is pictured below holding Bramble, the badger cub. He is survived by his parents, Kathleen, William and sister Andrea. Deirdre, Siobhain and Damian, may your gentle souls rest in peace. You are missed and will always remain in our thoughts. THE Badger Trust has warned that it is gearing up for a legal challenge to Farming Minister Jim Paice's plans for a badger cull in England. The Trust said it was 'closely examining, from both the legal and scientific points of view' Mr Paice's proposals to allow licences to be issued to farmers permitting them to cull badgers, which it described as a 'DIY killing regime'. The charity said it questioned whether the proposals meet the Government's 'declared criteria' for a 'carefully managed science-led cull'. The Badger Trust, which successfully halted plans for a badger cull in Wales in the courts, said it was 'extremely concerned' at the proposal to allow farmers to shoot 'free-running badgers'. The trust suggested farmers were only pushing for a cull because bovine TB affects their profits and that the annual slaughter of thousands of cattle was relatively insignificant in the wider scheme of things. "The justification for yet another cull lays much stress on the annual slaughter of 25,000 TB-infected cattle but fails to put this in perspective," the Badger Trust said in a statement." In fact about 300,000 cattle are killed each year because of such farmyard diseases as mastitis and foot rot as well as thousands of bull calves which are not commercially viable. But Bovine Tuberculosisseriously affects a farm's profit base. It prevents the lucrative trade in live animals between farms, which is the source of much concern to farmers." RSPCA director of communications David Bowles said: "We remain firmly opposed to any plans for a widespread cull based on current science, welfare concerns and practicality."…. He said vaccination combined with more cattle testing, improved biosecurity and stricter cattle movement controls was 'most likely to be sustainable and effective' in reducing bTB incidence in cattle.